Have you found an online vendor selling Captain Morgan Dark? 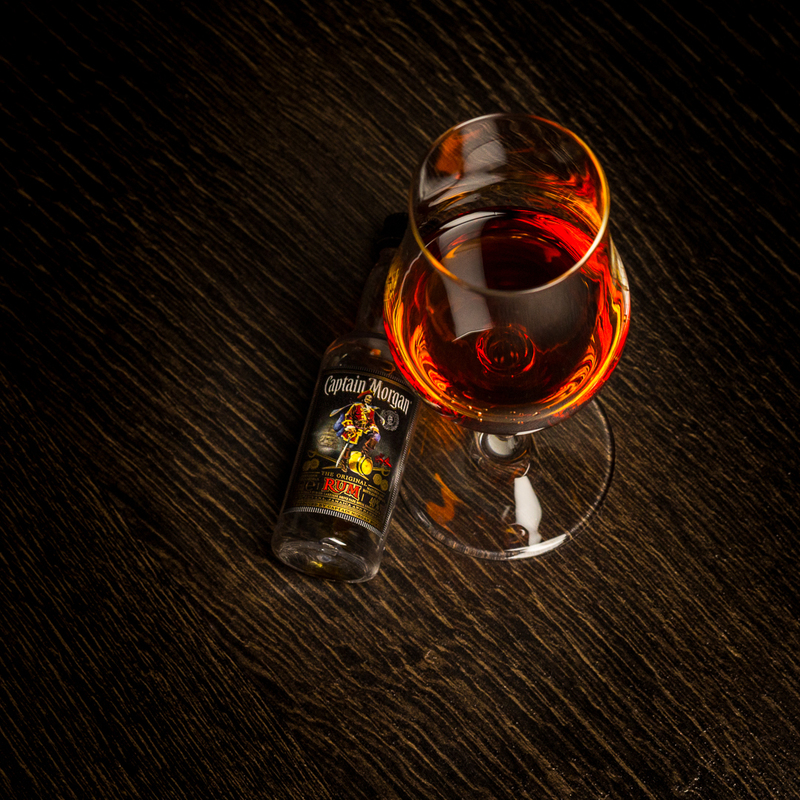 Captain Morgan Dark rum is a blend of five different rums from Jamaica, Guyana and Barbados. The blended rum mixture is distilled in a two part process using both pot stills and continuous stills and then aged for 2 to 7 years in charred oak barrels. Since 2011, the Captain Morgan rum brand has used the slogan ""To life, love and loot." Cheap rum for kids that only want to get drunk and throw up. This rum helps with the regurgitation burns on the way down and on the way up! Much better cheap choices. Thus is the thing my father warned me about he said spend a couple of extra dollars on a bottle you will save more than that on aspirin the next day. That describes this rum to a tee. I know this isn't the best rum, but it is my favourite, refreshing drink with coke when in a normal bar. Good for committing suicide, pleasing street bums or washing car rim's. Just don't bother otherwise. What quite surprised how good this one was mixed. A good mixer rum at a cheap price. Only reviewing this because it needs to be improved or taken from pub shelves. Why do so many bars have this as their main dark rum option? I used to drink it in a tall glass three quarters full with coke. Didn't realise how sweet it was and didn't take notice of that sea foam froth it left behind. Stuff you drink in your 20s when you don't care. Wasn't long before I moved on from this to Jameson and coke, much better quality and taste for the same price. I'm turning into and OAP rum snob because of all these rum reviews and want for a finer rum, but besides that, it's fair comment that I won't drink this swill anymore. We're done Capn, it's over. A good one with cola, I drink it if I want to mix. To make this short - if you're just looking to get pissed drinking cheap crappy booze, go for it. But if you want to taste rum, don't bother. Industrial alcohol, sugar, colorant, and artificial flavors. Captain Morgan is my rum of choice when I go out or travel. I prefer to drink CM with Sprite Zero and enjoy roughness of the rum when being social with friends and family. It's not up to much but is probably one of the best known and first tried rums for most people. I dare say it switches off as many people as it turns on. It's like a fairly tasteless dark, alcoholic syrup with a burn. It's sweet in a cloying way, has a certain spice that is undistiguishable and bland. And strangely...it does taste ok in cola or Dr Pepper. That's about it. I find it hard to drink neat. It's way too rough and uninteresting. Cred că e bun în prăjituri... Sau să speli ceva cola sau... Atât. It's very good mixed with Coca-Cola, but not suitable for drinking it straight. To much taste of spirit, but I prefer this over the spiced one. If you care about taste and smell in rums this is not the rum for your. Pointless rum. Don't try pure, but it has definite qualities in coke or cocktails. I use it for cocktails that need a somewhat sweeter rum taste. Okey for coctails. Its the rum when you want to go safe with a low price. Sweet and contains ethanol (bit too much distinguishable), so in all it's drinkable with cola, but far from being a good rum. If you desperately feel like having a Captain, the Golden Spiced will be a better choice. schmeckt mann überall raus aus jedem gemixten drink hat so einen eigenen geschmack! pur geht gar nicht! ich mag ihn einfach nicht sorry..
No big emotions drinking this with coke. It's the only way to taste this beverage. Do not drink it by itself. Add it to something else. Than it works.